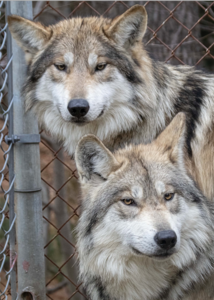 BRIDGEPORT, Conn. – Connecticut’s Beardsley Zoo is pleased to announce two new additions to the Zoo family, a pair of young Mexican gray wolves (Canis lupus baileyi). Born on May 13, 2017 at the Endangered Wolf Center of Eureka, Missouri, the brothers arrived on December 6, 2018, and have been in quarantine, required for any new Zoo arrival. The males have now joined the Zoo’s remaining female to begin a small pack. The Zoo lost a second female due to a medically untreatable condition last month. Guests will be able to view the three Mexican Gray wolves between 9:00 a.m. and 4:00 p.m. daily from the W.O.L.F. Cabin (Wolf Observation Learning Facility). The Mexican gray wolf (Canis lupus baileyi) or “lobo,” is the most genetically distinct lineage of gray wolves in the Western Hemisphere, and one of the most endangered mammals in North America. By the mid 1980s, hunting, trapping, and poisoning caused the extinction of lobos in the wild, with only a handful remaining in human care. In 1998, a new chapter in the Mexican gray wolf’s history began, with a homecoming that changed the landscape. According to the Wolf Conservation Center, today in the U.S. there is a single wild population comprising only 114 individuals, a slight increase from the 113 counted at the end of the 2016.